Charles V was ruler of the Holy Roman Empire from 1519 and, as Charles I of Spain, of the Spanish realms from 1506 until his abdication in 1556. At that time his realm, which has been described as "the empire on which the sun never sets," spanned nearly 4 million square kilometers across Europe, the Far East, and the Americas. As the heir of three of Europe's leading dynasties � the Habsburgs of the Archduchy of Austria; the Valois of the Duchy of Burgundy; and the Trast�mara of the Crown of Castile and the Crown of Aragon � he ruled over a Spanish Empire of extensive domains in: Central, Western, and Southern Europe; and the Castilian (Spanish) colonies in North, Central, and South America, the Caribbean, Asia, and the Philippines. 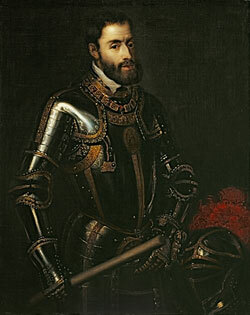 As the first king to reign in his own right over both Castile and Aragon following the end of the Reconquista, he is often considered as the first King of Spain, co-reigning with his mother, in name only Queen Joanna I. Charles I of Spain provided five ships to Ferdinand Magellan and his navigator Juan Sebastian Elcano, after the Portuguese captain was repeatedly turned down by Manuel I of Portugal. The commercial success of the voyage (first circumnavigation of the Earth), temporarily enriched Charles by the sale of its cargo of cloves and laid the foundation for the Pacific oceanic empire of Spain. Charles' reign constitutes the pinnacle of Habsburg power, when all the family's far flung holdings were united in one hand. After his reign, the realms were split between his descendants, who received the Spanish possession and the Netherlands, and those of his younger brother, who received Austria, Bohemia and Hungary.